The anticipation around Topshop’s first U.S. store is, safe to say, feverish; sidewalk campouts and massive crowds are expected when the British fast-fashion chain opens in Soho in mid-November (478 Broadway, nr. Spring St.). The rabid following includes international style goddess Kate Moss, who was wearing the stuff before management got smart and asked her to design a line for them. 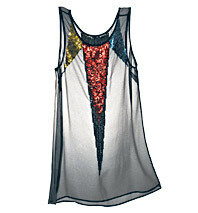 The U.S. flagship will feature a special boutique to showcase Moss’s glam-rock fall collection, which includes this sparkly sequined tank (approximately $46). And should you want to look even more like Moss, there will be free style advisers on-site. For more store news, click here.